5. Ms. Marvel #30 - Who Is Going To Organize The Spring Fling? 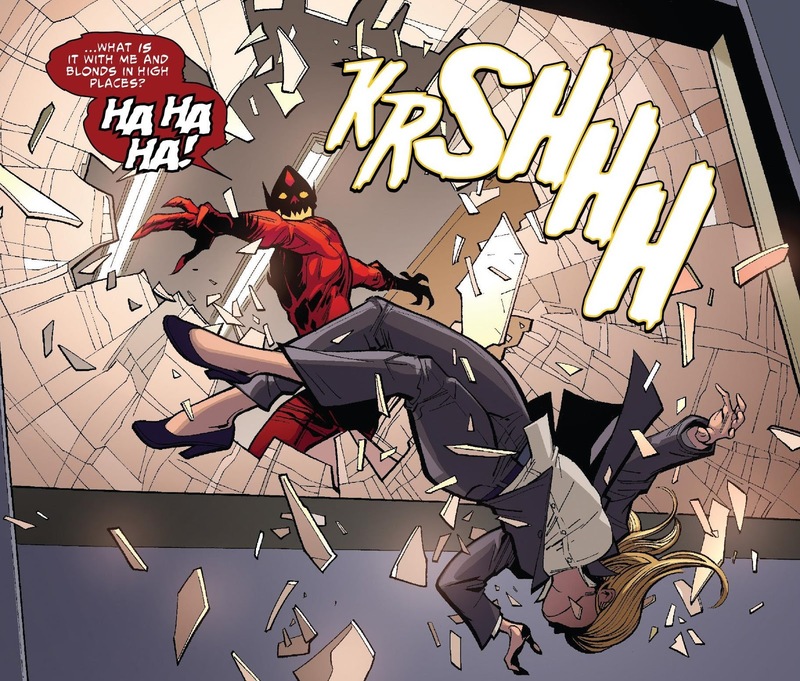 I love everything about this panel! This issue was extremely meta on how they handled the spring fling, you know if a genre teen story has a dance coming up then something is going to go down, and our heroes were prepared for this. I also enjoyed the line about Zoe and Josh - two characters who could have easily been background characters show so much character development throughout the course of the series, especially Zoe. Damn, I've grown to love Zoe. She's probably my favorite character of the whole series. I'm glad she is finally finding the happiness she deserves. Speaking of supporting characters with great character development - let's talk about Flash Thompson! The character that defined the generic high school bully, who later turned into a hero. I love that he discovered that his hero and best friend were the same person. It was such a poetic ending for his character. 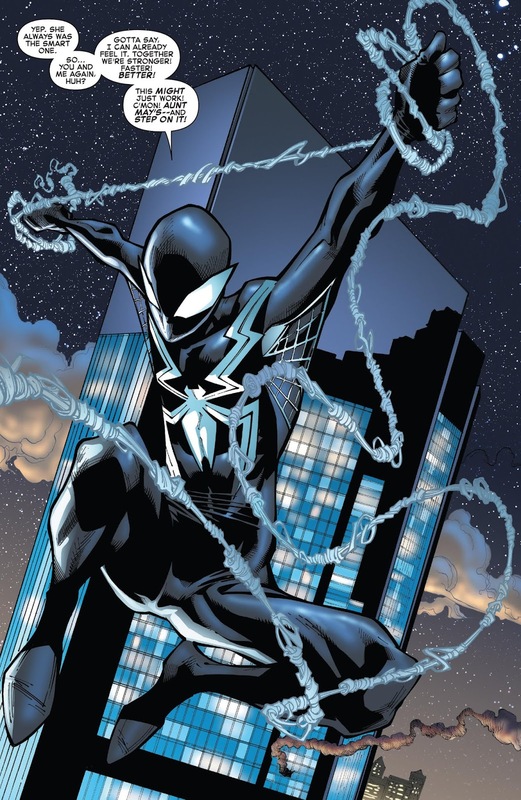 This is Spider-Man right here! He takes a bullet to save his greatest enemy, and to save J. Jonah's humanity. 1. The Amazing Spider-Man #800 - Flash Thompson is my Hero! 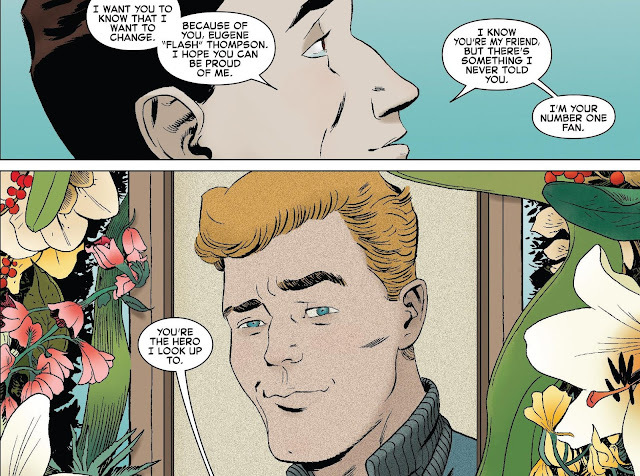 I got teary eyed with this one, what a beautiful send off to Flash Thompson. 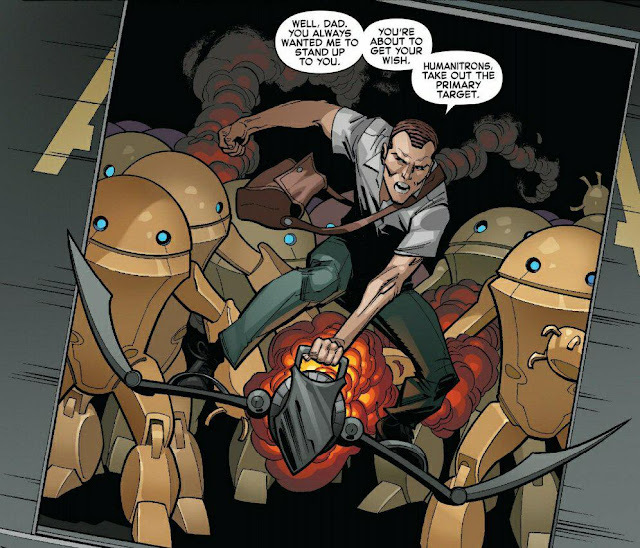 It shows that Flash didn't just learn from Peter, but Peter also learned what it meant to be a hero from Flash. 5. Valiant High #1 - He's All That. 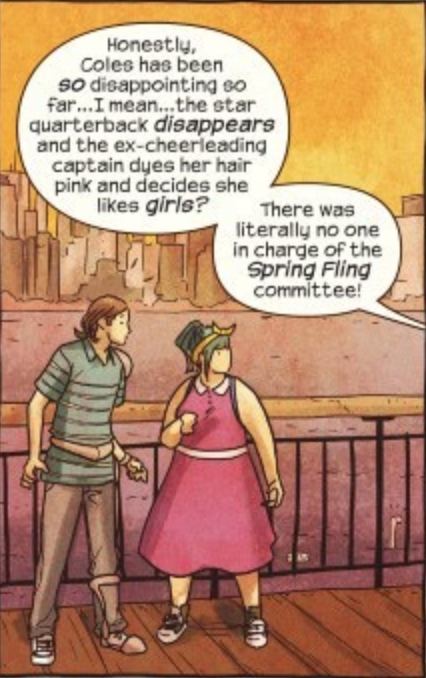 This is just a funny line from an off-the-wall book that presents the Valiant Universe as if they were all in high school together. Love where they're going with this plot. This is just a hilarious scene to me. To learn that super serious Damian sneaks into an arcade at night to play, of all things, Cheese Viking is just too good. Anyone that knows anything about Spider-Man knows where this line came from, and it just speaks of the ruthlessness and heartlessness of Norman Osborn here. 2. 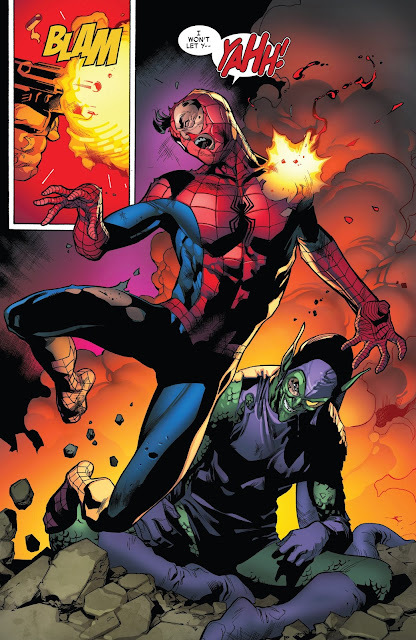 The Amazing Spider-Man #800 - Why? 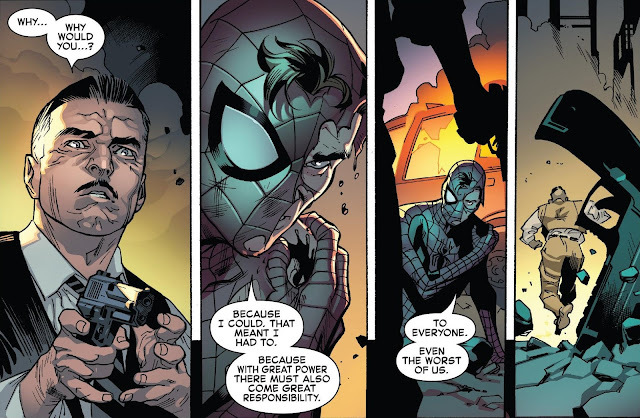 I cheated a little here as it's technically four panels, but this sequence in the aftermath of JJJ shooting Peter is just so powerful. 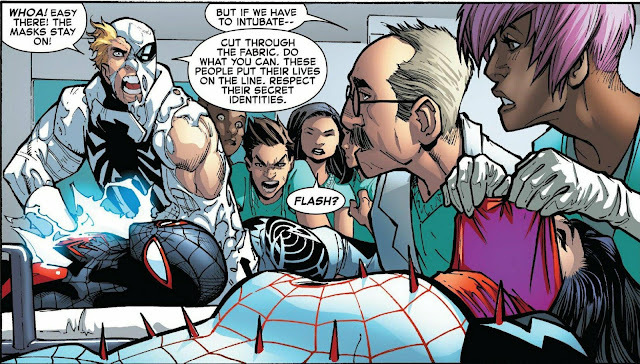 After all these years, Spidey is teaching Jonah a very important lesson here, the lesson he's tried to live by his entire superhero career. Flash speaking his final words calling Pete - not just Spidey - his hero and friend, is so touching and emotional. One of the best scenes, yet saddest scenes in the book and in Slott's long run. 3. 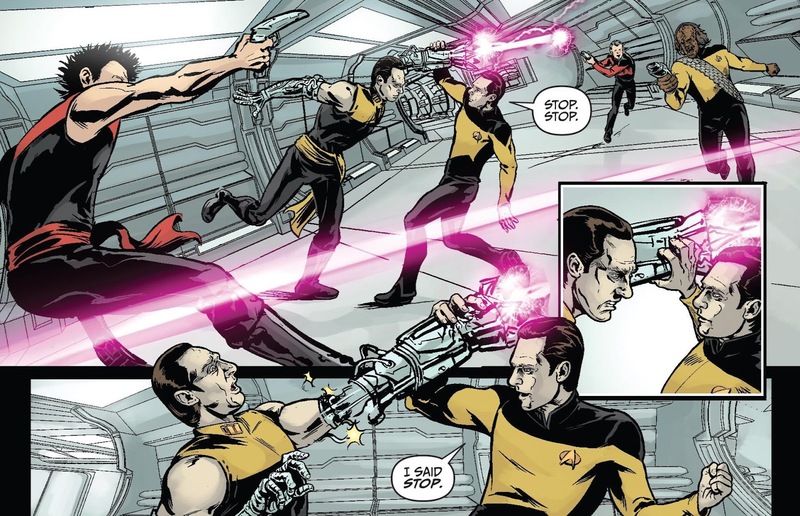 Star Trek: The Next Generation -Through The Mirror #5 - Stop! It's funny when Batman does it. 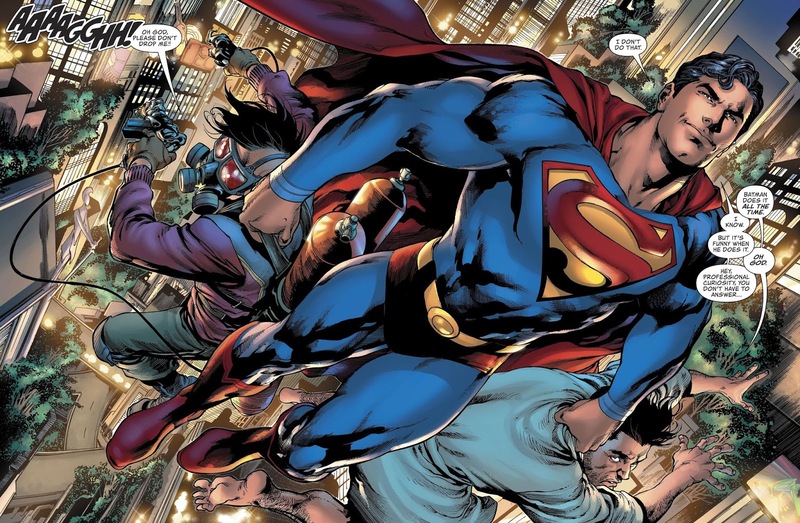 One of the most known comic book taglines gets a new twist and I love it! The line coming from J'onn is perfect and not to be outdone Ollie responds in true Ollie fashion with "Hey I didn't ASK for RESPONSIBILITY!" This is just an awesome scene and barely beat out Star Trek and Gabby (X-Men Red) for the 5th spot, it was a tough week. 4. Batman: Prelude to Wedding: Robin vs. Ra's Al Ghul #1 - Deal! Damian and me, we have a history, one built on a cycle of love, hate, and at times love to hate. But this, this is pure love. 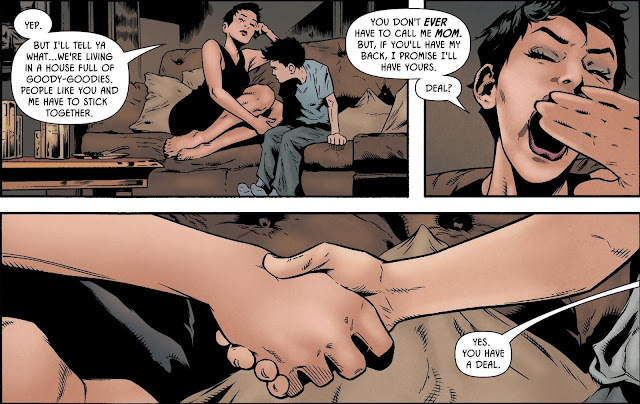 I love this scene, Selina and Damian coming to an agreement that they will always have each other's backs, I hope we see this play out. 3. The Man Of Steel #1 - He Didn't Sell It! I don't care tease me because I am saying it, this was adorable! I love that Jon is growing up and his uniform is getting too small, maybe we can see a new (better) uniform? But the reason why this is here, is because we all been in this scene, as the parent, or child. The kid tells one parent what the other parent said but not the context and the parents give each other the look like "really?" This is that moment and it is a small moment but man I loved it. This is the Lane-Kent's that I know and love. 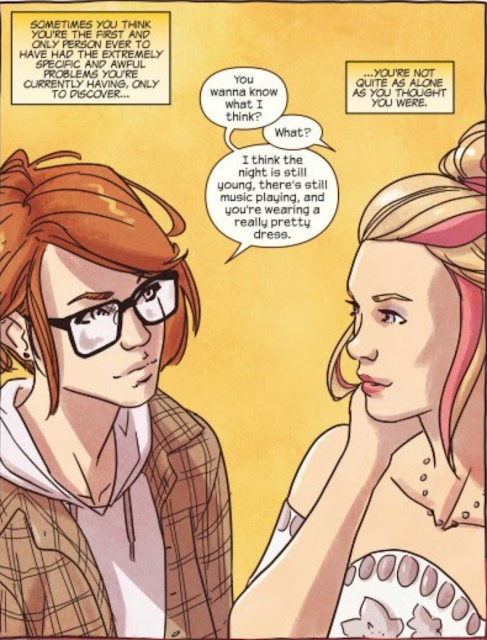 Bendis you get my stamp of approval. 2. 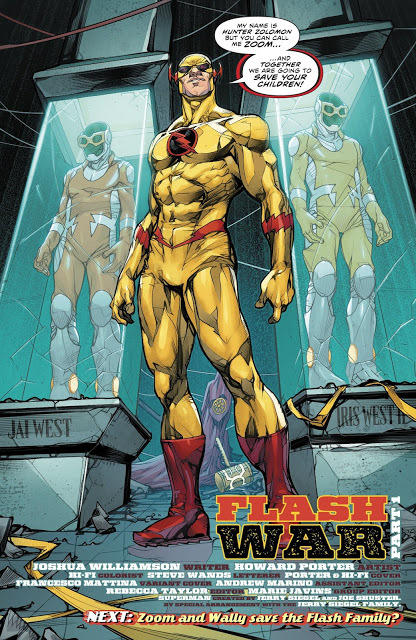 The Flash - Speed Buggy Special #1 - Love/Hate! As the caption says I both love and hate this scene. Why? Because I love that we finally have Wally and Linda together again and those lines YES!!!! 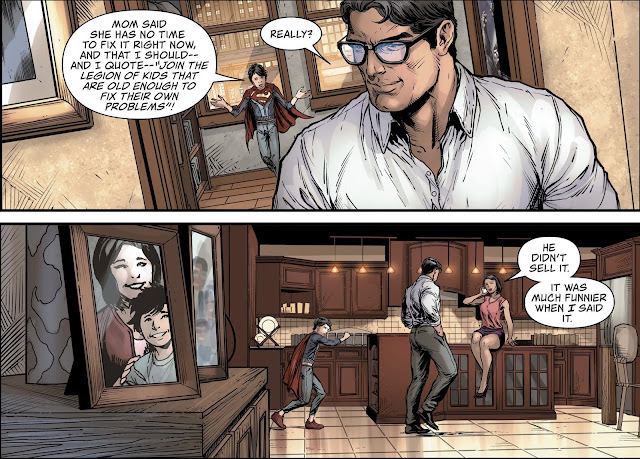 Those lines are 100% Wally & Linda, but I hate it because this isn't in a book like The Flash or Titans, this is in a crossover that isn't in continuity. DAMN YOU DC!!!! So many teases here like Bart being back (even if he is in Bar Torr's costume) he was in character and all! COME ON DC!!!! 1. 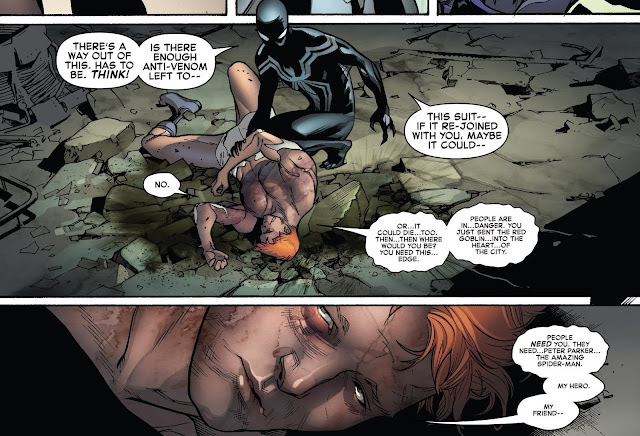 The Amazing Spider-Man #800 - Flash Thompson Is My Hero/Did I Ever Tell You're My Hero? Bette Midler's song "Wind Beneath My Wings" was playing in my head during the funeral scene and man it fit so right here. I hate that Flash is gone, but I hope he does return, we deserve to have Peter and Flash be actual friends with no secret identities between them. HONORARY MENTION: The Amazing Spider-Man #800 - Go Get 'im Tiger! The moment with M.J. and Peter was not very big however I loved it. 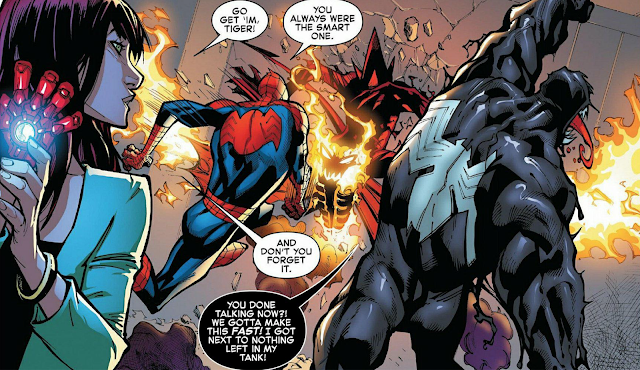 An Amazing Spider-Man issue is not complete without M.J. saying tiger in it. This scene is priceless as we get to see Harry riding the Goblin Glider playing tribute to the days he was the Green Goblin. 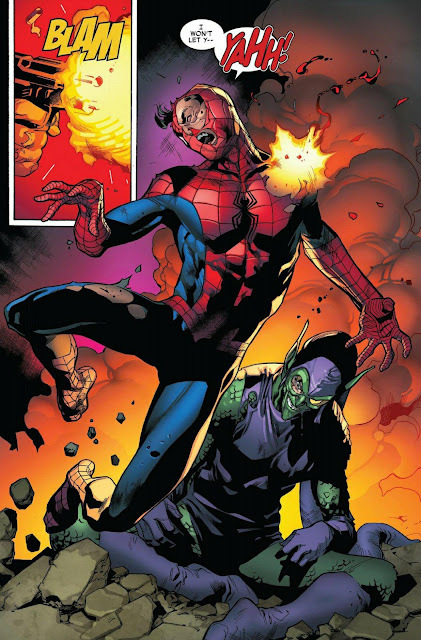 Spidey taking the bullet to make sure Norman Osborn lives shows that nobody dies while Spidey is on the clock, and gives the true meaning of "with great power comes great responsibility". 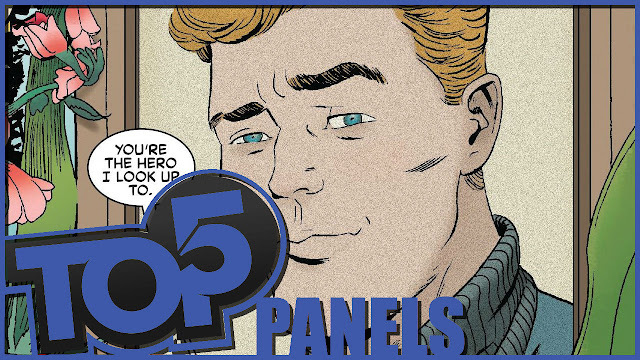 Great panel here with Flash making sure the heroes' identities are not revealed. 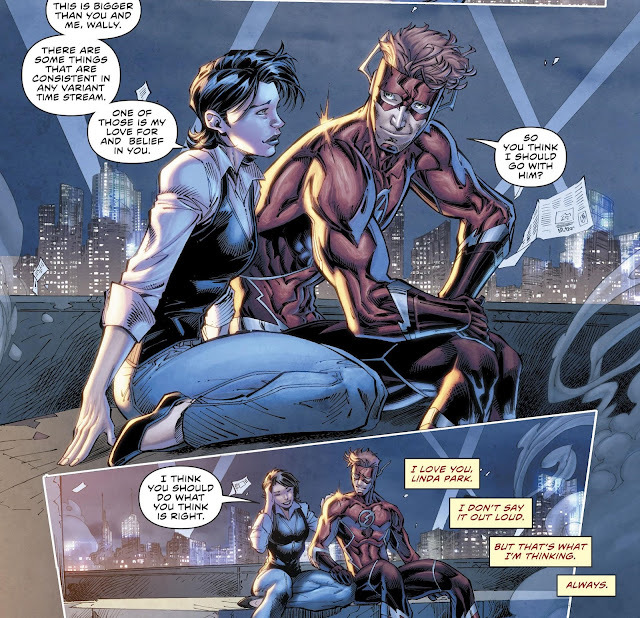 Flash's final words to Pete were truly "Amazing". 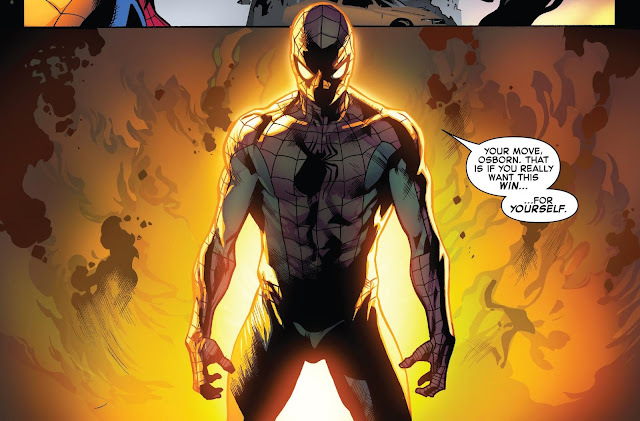 This panel says it all.I cried my eyes out doing my review on this part. Rest in peace Flash.